All spray sealcoating machines have some sort of power system to – at least – drive the pump. This power system may also drive the agitator. Self-propelled squeegee machines have an engine to power the drive, but this is a separate discussion and will be addressed later. Most trailer or skid based models have a small gasoline engine to power the different systems on the machine. Most use reliable brand name engines like Honda and Briggs & Stratton. Any of these brands are completely reliable and should not be a major issue when making a purchasing decision. The horsepower of the engine, however, can be an issue. It is important that the engine is matched up properly with the system it is driving, so when you are making comparison’s be sure to keep this in mind. Again, at least most of the major manufacturers have been around long enough to know how much power systems require. On large truck system models you will often have the option of installing a PTO or power take off system for powering your machine’s systems. 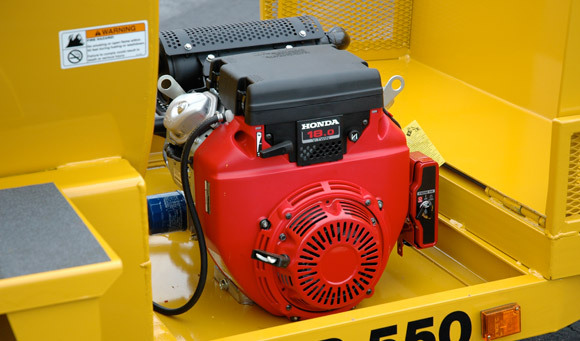 The PTO system draws power from the truck the sealcoating machine is mounted to, bypassing the need for a smaller - and often more noisy - gasoline engine.